Depending on your location, you may need to use rounded payments in your transactions. Luckily, Ascend makes it easy to set that up for you and your customers. 1. Navigate to Options > Sales and Returns from the Ascend desktop. 2. Check the box for Rounded Payments to activate payment rounding in your transactions. 3. Select the amount you want to round by from the first dropdown. The default is .05. 4. Then select the type of rounding from the second dropdown. The default is Traditional Rounding. 5. Select Apply or OK to save your changes. 6. 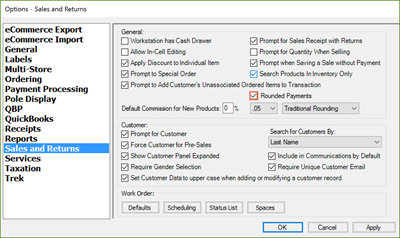 Navigate to Database Explorer > Payment Types and check the Enable Rounding option for all types of payment in which you would like Ascend to automatically round.